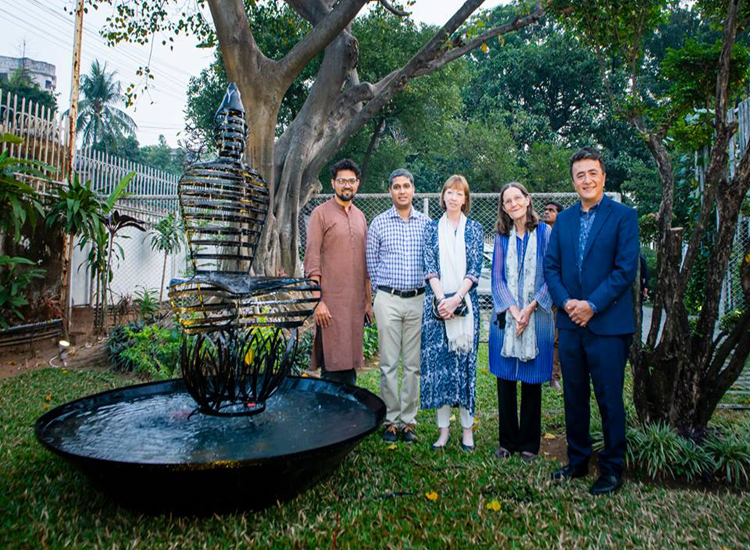 The two weeks scrap metal sculpture fountain exhibition held from 22nd February to 7th March, 2019 was hosted by the British Council in its beautiful garden. The series of metal sculptured fountains are mostly made with the scraps from the mobility aid making workshop of the Centre for the Rehabilitation of the Paralysed (CRP) in Savar. Aiming to up cycle and bring in positive environmental effects of water features, this first of its kind; 3rd in the series and 4th exhibition in same line is the 15th solo of Arham Ul Huq Chowdhury, a volunteer since 2000. Ms Alison Blake, British High Commissioner to Bangladesh, Andrew Newton, Deputy Director of British Council Bangladesh and Valerie A. Taylor, Founder of CRP attended the opening ceremony of the exhibition.